Harmony Springs Alpaca Farm is an alpaca farm located in Baker, West Virginia owned by Richard, Katherine and Amy Phebus. 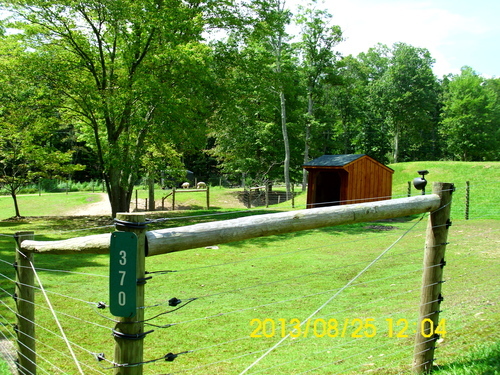 "Harmony Springs from our Humming Herd"
Our new site, harmonyspringsfarms.com, is with Openherd. 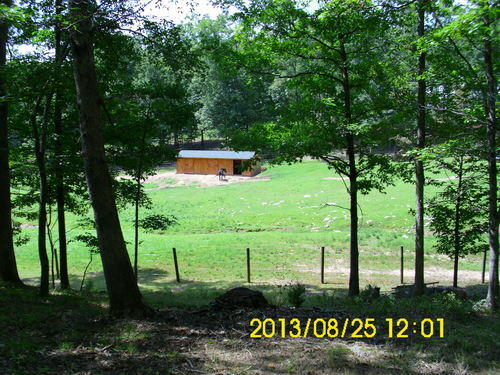 We're located in the cool mountains in WV at 1,850-2,600 ft. above sea level, so our herd likes it here! The drive (providing high views down into the beautiful mountains) ends just off Corridor H.
We're approx. 16-20 miles from the VA line via Route 55, then Corridor H; About 35 minutes from I-81, Strasburg, or N of Harrisonburg, VA. Gainesville & Haymarket 1 1/4 hrs; and about 2 hrs from I-95 Fredericksburg, VA or Washington, DC (North I-95 few more minutes) . We're 2.5 hrs from I-79 or Morgantown, WV. Central to Western PA farms approx. 1 1/2 to 2 hrs & 3 hrs further East or North! We welcome alpaca farm or startup farm inquiries. Our alpacas hum a lot and are friendly... some will let you pet them. 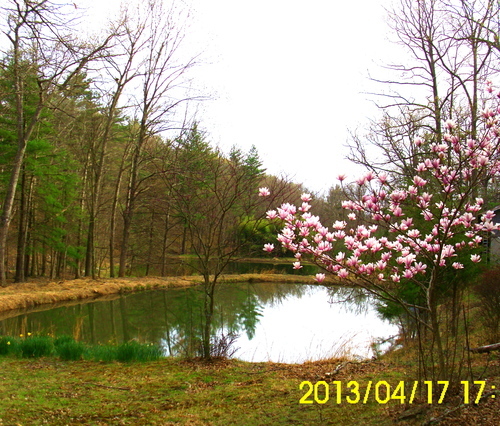 "Harmony Springs from our Alpacas" & spring-fed waters .................. CLICK on PICS! Our Spring-fed Creek is so-o COOL in August!! Horse took a little nap. Where'd they go? To shade up on the hill! 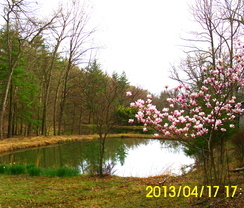 We named our new home "Harmony Springs Farm/Farms" in the 1980's (long before we started farming). Recently our daughter proved that she works really well with alpacas, so we started Harmony Springs Alpaca Farm. Look at our Herd, Blogs..farm pages.. great lineages...entire herd stems from champion/multi-champion &/or famous names..many lineages of AOA/AOBA show ribbons.. pictures &Certificates. They're intelligent & interact as do human families! Amy has added to her herd for quality & gene variety! She loves caring for them, spends extra time watching over, sitting & listening to them. The humming & friendly nature can be great therapy for anyone who wants or needs to relax again! AMY's EYESIGHT IMPROVED SEVERAL TIMES WITH THE ADDITION OF ALPACAS TO HER LIFE! We're told neighbors laugh weeks/months... sitting quietly.. watching TV.. burst out laughing w memories of our herd. Bought w dam @ 1 1/2 wks old, 1st cria "Wings" attempted Amy's name. When realized this, I asked: A-Mae-Mae brings Wings hay? He pronked..did twisting turns quite a while. Amy's sight fluctuates according to how much time spent w the alpacas..eyes improve! We've had 7 births (Royal lines). Bought: TRITON's LAZER...Genes of Multi-BLUE RIBBON, 2X WHITE Color Champ-KAF TRITON (HDF Prince Phillip/NWA, LTD Predictor). Lazer's dam Elk Mia Rae.. 2 Color CHAMPS: 5P Girasol & 6Peruvian AccoyoGrandTriumph IMPR98 (so DENSE, could CLASSIFY as PERUVIAN NATIONAL TREASURE)! We already had Hemingway's & Snowmaster (from two of 7 sons) "fineness" genes! WORLD CLASS foundation names: Hemingway; Snowmass': Snowmaster/De Beers/Incaaccoyo Star/Condornar to H B's C's ADONIS; Mountain Edge's RAYO (Black Magic/Pizazz); Auzengate Χmbote's: GG Ulysses&Corazon; Ameripaca's Kensington &Solomon; Vengador's Accoyo Alexander; Acero Marka's Champ/Frwrd Pass/ Bonanza/ Firecracker/Frizeaze! Macusani's Fleecy Dale Bon-Bon; Legacy of Bolivia, Royal Fawn's-MFI Peru Monte Carlo; Royal Fawn son Monte Carlo; Camelot/Galant Physique; Sir Lancelot; Cuento/MM 3 IN A ROW/The Silversmith/Silvercloud/ Silver Medal Cody, World Class Smoke Storm! But grandaughter stated best trait: "Grama I just sat down and they came to me!" She elaborated w names she wanted to remember... like Diamond Mia, Diamond Aura, Buttercups AMY, Nevaeh, Amado, Kahlua&Snow, Wings&Nike... even Destello's "Black Caviare" in other fields! Alpacas were a necessity for us...Reasons&Rewards: far beyond financial profit! Unlike camels/goats w part cashmere fiber, all hypo-allergenic alpaca fibers are used. Try a scarf of alpaca/cria's fiber! Sit w a child...grandchild in shade on alpaca fields...listen as they "HUM." After neck rubs, eating nearby, giggle or fall asleep from HUMMING! Cashmere-like fiber & taking them to shows is just a beginning. In Amy's case, "SIGHT" comes back over & over, reducing fluid behind retinas. THEY MAY HEAL YOU WITH THEIR HUMMING. The harmony they share can be LIFE CHANGING! 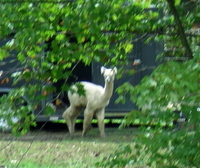 Amy offers financing for sale of alpacas. Breedings are pmt in full.